You can now hold a one-minute conversation with someone. Hi, how are you, what's your name, and bye. Let's add a few more questions and answers so that you can make small talk and even get to know someone - at least, start to get to know them. You also use tengo to tell someone your age. 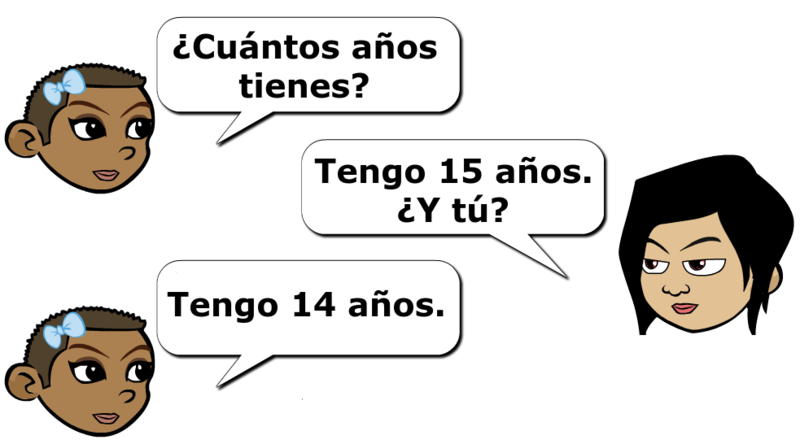 In Spanish, to say you are # years old, you say you have # years. Take a look at how you ask and answer How old are you? (I also included how to ask for someone's birthday, where you don't use tengo). I'm #. Tengo # años. It's [month, day] Es el [day] de [month]. Listen to the musical version of asking and answering the first question. Now listen to Ricardo and Elena ask about both age and birthdays. E: Hola, Ricardo, ¿cómo estás? R: Bien, gracias Elena. ¿Y tú? E: Bien, gracias. ¿Cuántos años tienes? R: Tengo 23 años. ¿Y tú? E: Tengo 25 años. ¿Cuándo es tu cumpleaños? R: Mi cumpleaños es el 7 de octubre. ¿Y tú? E: Mi cumpleaños es el 9 de junio. R: Qué bien. Bueno, hasta luego. E: Hi, Ricardo, how are you? R: Fine, thanks, Elena. And you? E: Fine, thanks. How old are you? R: I'm 23. And you? E: I'm 25. What is your birthday? R: My birthday is October 7th. And you? E: My birthday is June 9th. R: Great. Well, see you later. How you say how old you are is with the formula Tengo # años. How you say when your birthday is is with the formula Mi cumpleaños es el # de [month]. Tengo # años. I'm # years old. ¿Cuándo es tu cumpleaños? When's your birthday? Mi cumpleaños es el # de [month]. My birthday's [month] #. Listen to Mercedes (Merche) and Víctor. M: Sí, tengo dos. Tengo un hermano y una hermana. ¿Y tú? M: ¿Cómo se llama tu hermana? V: Se llama Sóle. ¿Y tus hermanos? M: Se llaman Pancho y Paty. ¿Cuántos años tiene tu hermana? V: Tiene once años. ¿Y los tuyos? M: Tienen siete y cuatro años. V: Merche, do you have siblings? M: Yes, I have two. I have a brother and a sister. And you? V: I have a sister. M: What's your sister's name? V: Her name's Sole. And your siblings? M: Their names are Pancho and Paty How old is your sister? V: She's 11. And yours? M: They're 7 and 4. To ask about siblings, use the phrases below. ¿Cuántos hermanos tienes? How many siblings do you have? No tengo. I don't have any. Tengo uno, una. I have 1. Tengo dos. I have 2. Tengo cuatro. I have 4. You can use tengo to ask about what classes your friends have this year. X: Hola Rafael, ¿qué tal? R: Bien, gracias Ximena. ¿Y tú? X: Bien. ¿Cuántas clases tienes este año? R: Tengo ocho. Tengo Matemáticas, Ciencias, Español, Inglés, Historia, Orquesta, Arte y Educación Física. ¿Y tú? X: Tengo siete. Tengo Matemáticas, Ciencias, Inglés, Español, Historia, Banda y Salud. X: Gracias. A ti también. X: Hi Rafael, how’s it going? R: Well, thanks Ximena. And you? X: Fine. How many classes do you have this year? R: I have 8. I have Math, Science, Spanish, English, History, Orchestra, Art & PE. You? X: I have 7. I have Math, Science, English, Spanish, History, Band and Health. X: Thanks. To you, too. Later you'll learn all sorts of uses for tengo that you wouldn't expect.